The Israel Police will restrict the entry of Muslim worshipers to the Temple Mount on Wednesday, due to intelligence information that was received about plans by Arabs to riot at the compound, as they have done several times already in recent days. The decision was made by the Jerusalem District Commander of the police following an assessment conducted Tuesday evening. According to the decision, only Arab men over the age of 50 and women of any age will be allowed to enter the compound. Police will be deployed starting early Wednesday morning in eastern Jerusalem and the Old City to prevent disturbances. On Monday morning, the Jerusalem Police stormed the Temple Mount and locked Arab rioters inside the Al-Aqsa Mosque. The police had gathered intelligence about Arab youths who had spent the night at the Temple Mount compound. 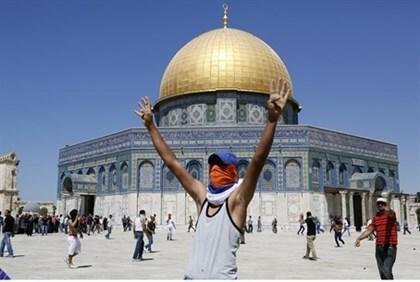 The youths had collected rocks and fireworks and prepared firebombs, which they stored inside the Al-Aqsa Mosque in order to use them against police and interfere with non-Muslim visits to the Mount. Rabbi Shmuel Rabinowitz, the rabbi of the Kotel (Western Wall) and Holy Sites, decried last week the Arab attempts to wreck the week-long Sukkot holiday by launching violent riots against police and Jewish visitors on the Temple Mount, the holiest site in Judaism.